Farrah “Digit” Higgins may be going to MIT in the fall, but this L.A. high school genius has left her geek self behind in another school district so she can blend in with the popular crowd at Santa Monica High and actually enjoy her senior year. But when Farrah, the daughter of a UCLA math professor, unknowingly cracks a terrorist group’s number sequence, her laid-back senior year gets a lot more interesting. Soon she is personally investigating the case, on the run from terrorists, and faking her own kidnapping– all while trying to convince a young, hot FBI agent to take her seriously. So much for blending in . . .
Annabel Monaghan lives in Rye, New York, with her family. This is her first novel for teens. 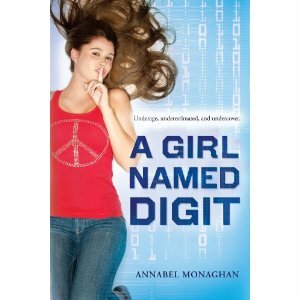 Farrah Higgins finally has the chance to ditch her nickname of “Digit” and her geeky past of being a mathematical genius when her father (a math professor at UCLA), moves the family to be closer to work right before her freshman year. She is befriended by the cool girls who come across initially as total self absorbed losers at first and has her first kiss by the hunky guy everyone has the hots for. All according to her plan, right? When she throws up at the party after the kiss (it grossed her out), she earns a new nickname: Party Girl. She tries to keep up with the other girls by watching a stupid teen television show and sees a string of numbers that scroll by the bottom of the screen. Of course, Digit can’t leaves those numbers alone, so she figures out that they are a reverse Fibonacci sequence with 9/11 at the end. Within days after the discovery, there is a terrorist attack on a private jet at JFK and she tries to go to the FBI, which sends her to the “nut room”. There she meets cute with a new agent, John Bennett. Don’t worry, there isn’t a huge age difference between the two since she will be 18 in six months and he is just a bit over 21. Digit/Farrah decides to take matters into her own hands and drives to the studio in Orange County that airs the teen show. When she starts to ask pointed questions, she finds that the man answering them is acting strange, she tries to drive to the police department but in a wrong turn, ends up back at the FBI while the TV guy is following her. The agent, John, discovers that the man following her is an eco-terrorist, known for violence. The FBI stage a kidnapping to keep her safe. Whew. The plot continues from there with a breakneck speed with Digit and John researching clues while she uses her mathematical genius to decipher the patterns while John has special language skills. The two make a great team and compliment each other. Of course, they also discover for the first time that they each have met someone who they can be perfectly honest with for a change. What made this book most enjoyable for me is that the author made the whole plot believable while staying true to the characters she introduces. Even the the cool girls at the high school have some depth and shows how Digit herself was guilty of the same profiling she was subjected to. The budding romance between John and Digit is handled remarkable well, even with the age difference. John doesn’t want to become involved with her until she turns 18. YAY! There is some kissing, alcohol use, alluded violence and some language, but not much to worry about. I would recommend this one to anyone who enjoys Gemma Halliday’s YA series or Meg Cabot. wow..i love the sound of this fast-paced action packed novel. Lovely review..and i love that it felt believable. So glad you absolutely adored this–it sounds right up my alley! Not on the radar yet for my library system, but it’s on mine, I will be keeping a look out for it!